According to Egyptian Newspapaer Al Ahram, Mostafa Waziry, Qurna Antiquities manager, had attacked a tour guide and slapped him 7 times after he made one of the guards hold the tour guide down and there was a religious reasons behind it as the tour guide comes from the same town of Mostafa Waziry,Naga Hamadai – north of Qena. It was also mentioned that the Luxor tour guides syndicate threatened that all tour guides in Luxor will start a strike if Mostafa wasn’t held down and slapped 7 times as he did to the tour guide. Earlier today there was an email sent to Luxor Times from Dr.Zahi Hawass office says what’s below. 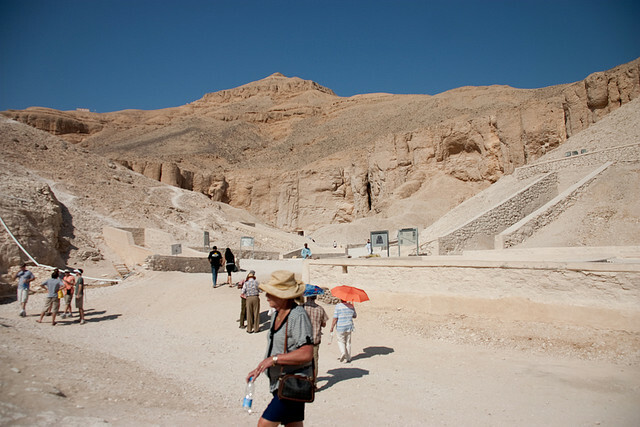 Dr.Zahi Hawass confirms that his orders concerning prohibited photography inside the tombs of Valley of the Kings on West Bank still valid and will not allow it to maintain the tomb and preserve it from destruction. Zahi added that it his main mission is to keep the tombs safe for the next generations which would be destroyed if they are not protected from all aspects of infringement. He said also that in the last 4 years there were 1400 cases of photography inside royal tombs and the offenders were fined and appologised for violated the instructions. Although it may sound a nig number but it is next to nothing in comparison to the number of visitors to the Valley of the Kings and they follow the instructions as their duty to protect such a unique human heritage and when some of them insist on violating the instruction and that’s why legal procedures are taking against them. Dr.Zahi Hawass mentioned that he received a note from archaeologist,Mosttafa Waziry, the manager of Qurna antiquites, denying that he had beaten or slapped a tour guide on Tuesday ponting out that the tour guide didn’t follow the instruction concerning photography inside the tombs and the inspector recorded the violation but the tour guide tried to give the inspector a 100 pounds as a bribe. Mostafa said that the cameras were used are at the police custody now with pictures saved on them taken inside the tombs of Ramses I and Tawsert. The Qurna antiquites manager said that someone who convinced the tour guide to report him to the police and claim that he slapped him 7 times and it is all in front of the court and it is not true at all what was said that it has a religious reasons.